Come and hear a wonderful story of evangelism, church planting and Christian growth. Colossians was a letter, which would have first been read by Tychicus in Philemon's house in Colossae. People who were to read that letter had been converted as a result of Paul's teaching in Ephesus (Acts 19). As they read they are about to understand better the reality of life in Christ and reading it years later we can understand better too. You will see the power of fellowship at work as a formerly useless slave and his master are brought together to work together as brothers in the Lord. Colossians And Philemon - Focus on the Bible by John Woodhouse was published by Christian Focus Publications in January 2011 and is our 19937th best seller. 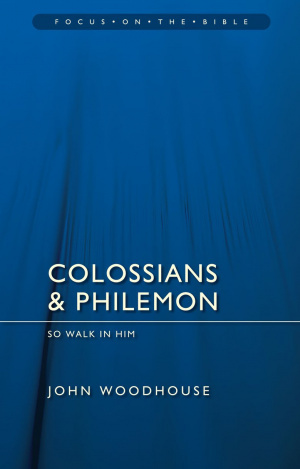 The ISBN for Colossians And Philemon - Focus on the Bible is 9781845506322. This is an engaging book on Colossians and Philemon. Although it is called a commentary it is written more in the style of a sermon, with each chapter divided into three or more points. However every verse is covered and the book has most of the hallmarks you would expect from a commentary including discussion of the meaning of Greek words where appropriate. Writing from a conservative evangelical point of view, Mr. Woodhouse accepts that these letters were written by the Apostle Paul from his prison cell in Rome. He takes the slightly unusual view that Paul did not write to the Colossian church to combat a specific threat of false teaching but rather that his purpose in writing was to confirm them and strengthen them in their faith. Turning to the letter to Philemon Mr. Woodhouse rightly says that it is a gem. His view is that fellowship is the main theme. The sermon-style structure means that this book is very readable and easy to apply to our own lives. There are helpful illustrations and clear applications. Each chapter ends with some study questions. Overall this is a good book that will help Christians grow in their knowledge and love of God and help preachers in sermon preparation. Got a question? No problem! Just click here to ask us about Colossians And Philemon - Focus on the Bible.